Definition: Change Management can be defined as the systematic approach to transforming processes, systems, structures, technologies and values, in order to correct the flaws and misalignments within the organization. It entails a set of activities that help the members to switch from their present way of working to the intended one. In business, change refers to any kind of variation in the traditional way of working, i.e. it can be the addition, modification and removal of policy, process, method or anything else, that has the capability of affecting the organization, directly or indirectly. The reason for implementing change can either be natural, i.e. out of survival, growth or expansion, or it can be reactive, i.e. to adapt as per the changing environment. Change Management encompasses careful planning and implementation of strategies while consulting with and involving the people affected by the change. It assists the organisation in introducing, undergoing and controlling change and helping the members of the organization to accept and embrace change, in the existing environment. Recognizing the need for change: First of all, the need for change has to be recognized, by identifying what will be improved, i.e. process, product, technology, method, etc. For this purpose, the team who will initiate the process and lead the venture will be appointed and resources for facilitating the process, are made available to the team. 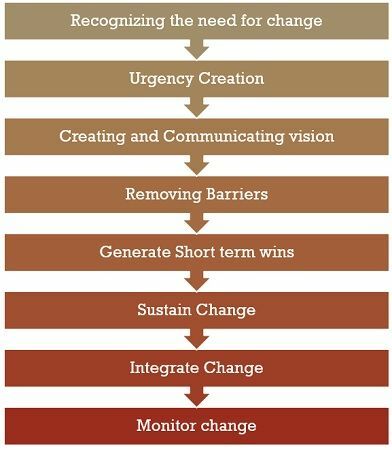 Urgency Creation: The next step to the process of change management is to make the employees and other members of the organization realize the importance of change and its benefits. It is a crucial step which must be dealt with and communicated carefully to the affected parties. Further, the affected parties should be given an equal opportunity to present their views, opinions and suggestions on the same. Creating and Communicating vision: Change must be initiated with a vision in mind, as it clarifies the future goals of the organization to the stakeholders. Hence, it is necessary to create and communicate the vision to the affected parties, so that they are aware of the fact that why change is being implemented. Removing Barriers: Resistance to change is one of the major barriers to change management. It can be explicit, implicit, instant or even deferred. Once the change is communicated, the management may get support from a few people only, while the rest may resist change. So, for effective implementation of the change strategy, barriers are to be removed as early as possible. Generate short-term wins: One of the best tactics for increasing the interest and morale of the team, is to create small milestones, which are easily achievable, so as to raise the morale and satisfaction in the team. However, long-term goals should not be ignored. Sustain change: Many times, change turns out as a failure due to a premature declaration of success in implementing the change. So, the change should be implemented properly and then wait for sometime to ascertain the gaps and flaws, and correct the same, as soon as possible. Integrate change: Training is to be provided to the employees to integrate change successfully in their daily routine. Monitor change: There must be a continuous mechanism to look after whether the change implemented properly or not. In a nutshell, change management refers to a process of formulating and implementing corporate strategies, plans, procedures and techniques to manage change originating from various internal and external factors.